According to Barry M. Carlos, the Bay Town label put together the players for this 45 out of quality Oakland session musicians. Fire including members of the Vandells and Tower of Power. Only 500 copies of this 45 were pressed. "Soul On Ice" is a reference to the Eldridge Cleaver book of the time. 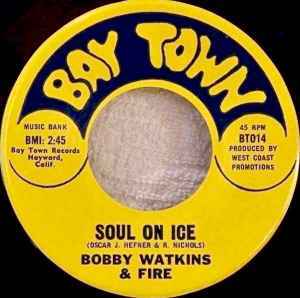 Bob Watkins also sang with The Soultons from 1967 to 1969. Quite a good singer.